Baby Bok Choy – Oh Joy! I am in love. 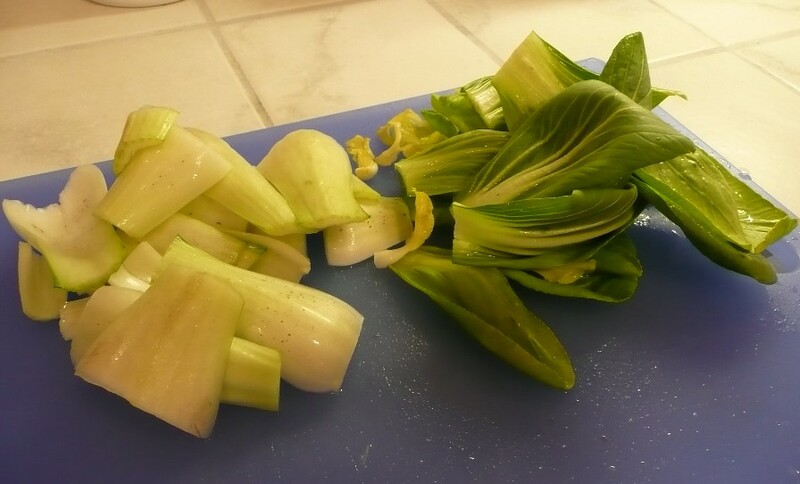 I first mentioned bok choy on my blog when I was talking about foods that Dr. Oz thinks will help prevent cancer. When I first mentioned it I thought I had never had it, but some commentors pointed out that I more than likely had it in Chinese food. Yeah, they, of course, were correct. I really like baby bok choy in my soup. I thought it would make a good substitution for green garlic. I thought it was more like an onion. The other day I decided to buy some and add it to a chicken dish I had made. Oh my. The baby bok choy added such a great flavor I wondered if I would like it sautéed by itself. So I cooked some up last night. I had faith I would like it. So much faith that I made my hubby collard greens, which he loves, so I wouldn’t have to share my baby bok choy. Oh my. It taste like butter. As I was eating it I kept thinking “butter”. So I wanted to verify that. So I sacrificed a bite to hubby. I said, “Does that taste like butter?” He agreed. I told him I didn’t put any butter in it and he said if he didn’t know better he would have said I was lying. To cook it, I cut the ends off the top green portion and chopped them up, then after they are cooked tender I throw in the chopped green portion and cook them a bit. My cooking method is to saute it in garlic olive oil, with some onions and garlic salt – yeah, my norm. I am convinced that boy choy does not taste the same although I have not tried it I just have experienced baby versions of veggies are different than “adult” versions. So I am sticking to the baby bok choy. It is a cruciferous vegetable. Which family “takes its alternate name (Cruciferae, New Latin for “cross-bearing”) from the shape of their flowers, whose four petals resemble a cross,” according to Wiki. Cruciferous vegetables have a lot of phytochemicals which are thought to have anti-cancer properties. Could be that they also contain a lot of vitamins and minerals and are not short on delivering dietary fiber. All of which I think contribute to health. I really believe that baby bok choy is a vegetable that people who do not like vegetables could use as a “gateway vegetable”. 🙂 They could eat it allowing them to get used to the idea of vegetables and it could help start them on the path of eating vegetables. What about you, do you like bok choy? Have you tried baby bok choy? I have a feeling that you will see more post about baby bok choy as I experiment with cooking it and eating it. 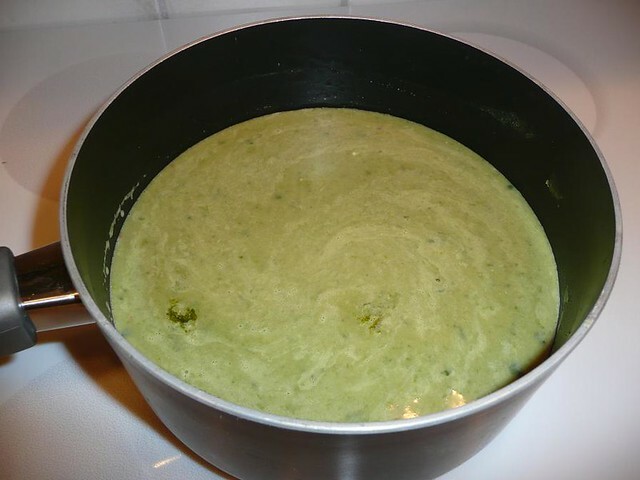 I was going off the “recipe” for Green Garlic and Spinach Soup, but I was not measuring and making it up as I went along so the measurements are not exact. When I served it I put some mozzarella in it. For hubby I put some raw onions and mozzarella. But I made him taste it BEFORE I added anything and he thought is was good without the added onions and cheese. I would imagine if you like pepper it would be a GREAT addition to this soup. I was going to serve it with hot sauce to my hubby because originally I thought it was going to be rather flavorless, but it turned out not to be flavorless and he liked it. Keep in mind that I made this up, never having made a soup like this and never having used the immersion blender. So you might want to read my “Experimental Soup” post so that you know some of the issues if you haven’t done something like this before. Basically keep an eye on things because this post is not a step by step, “turn stove on, turn stove off” kind of recipe. Sautee onions in the olive oil. When the onions look tender add in the chopped bottom portion of the bok choy. Let it cook a minute, then add the garlic. While the bok choy is cooking, add garlic powder and garlic salt to help the veggies sweat. 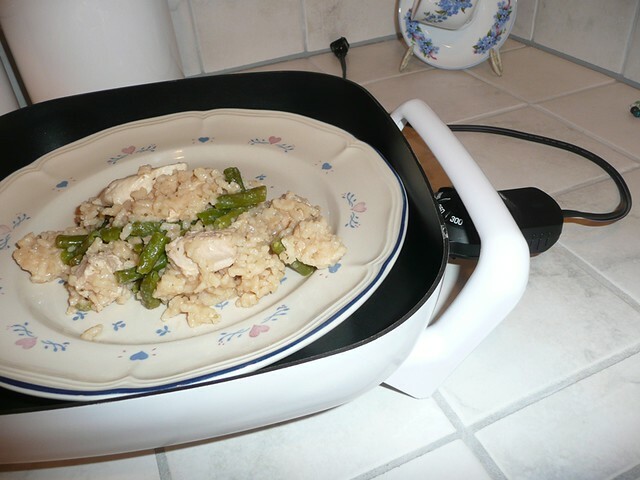 Sautee until tender. Then pour in the broth. Added some beer and teriyaki. Stir it as you feel necessary throughout the entire process. Bring to boil. Add the cream cheese if you are going to use it. Add leafy portion of the bok choy and bag of spinach. Gently boil for a few minutes or until the veggies are wilted. Once the veggies looked wilted use the blender to mix it all up.